OMG - It's a Gateau St Honoré...who knew...not the baker! Talk about dejà vu! 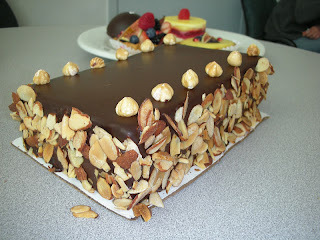 Our cake sponsor brought in his partner's latest creation to store in an office. Upon being seen it was OMG I haven't seen one of those in years. 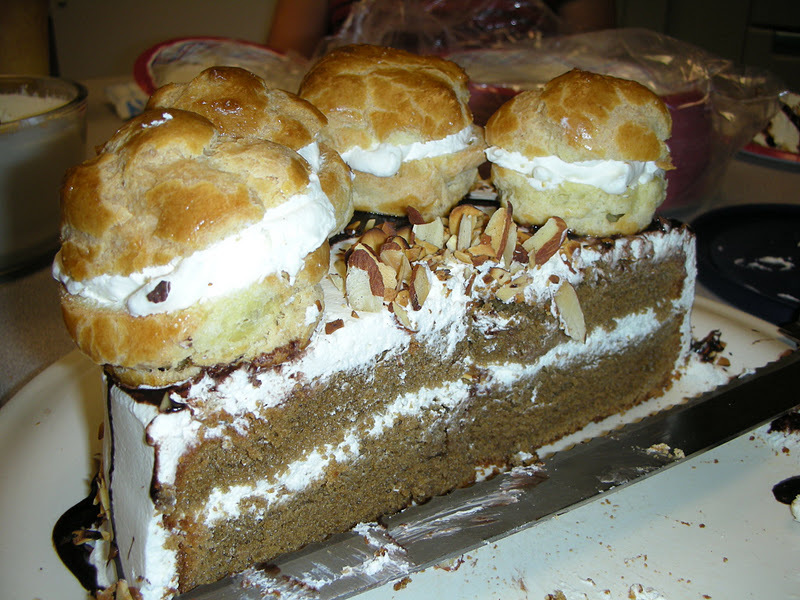 This prompted some surprise as the person who made it just made a cake based upon having see one with cream puffs on the top. Little did she realize that there is a particular cake that is exactly that. 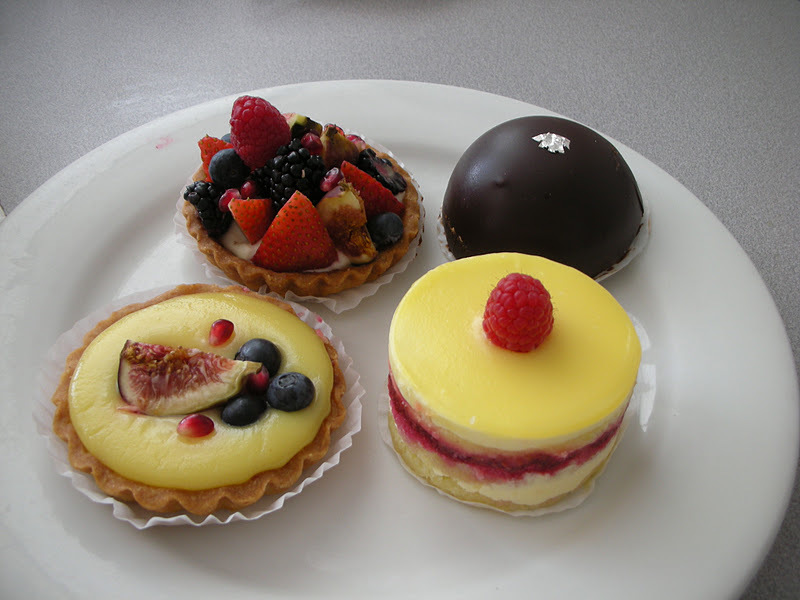 They used to be made by Rebecca's bakery in Boston and we used to get them on various occasions many years ago. It's been a long time however and familiar as it was we couldn't remember what it was called. In a situation like this when you are at a loss to remember something it's good to know that memory does not totally fail. 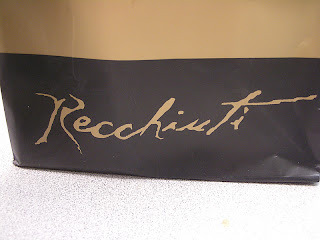 Indeed upon further concentration it was remembered that the name was French and began with gateau (mais, bien sûr) and then suddenly the second word St. came to mind. Of course at that point Google filled in the rest and we realized we had a Gateau St. Honoré!! 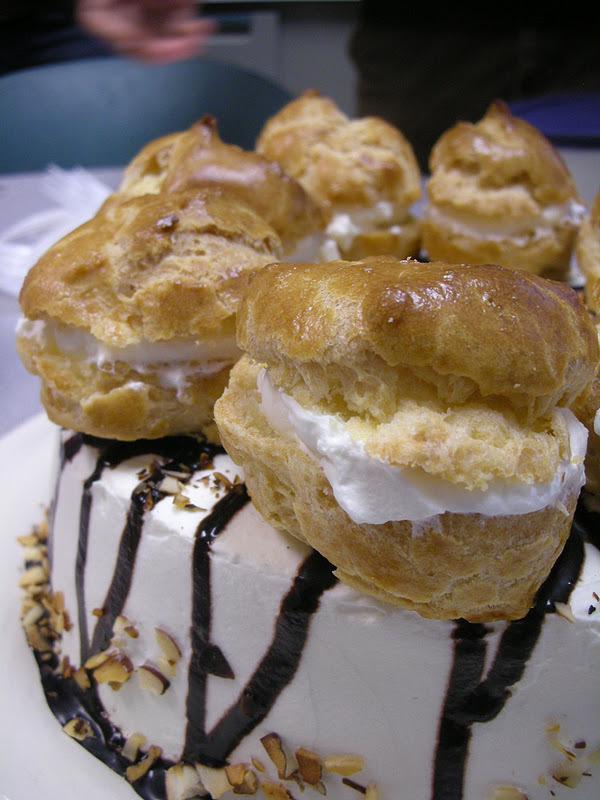 This is indeed a cake, usually whipped cream based, that is decorated with cream puffs on the top and frequently on the sides also. 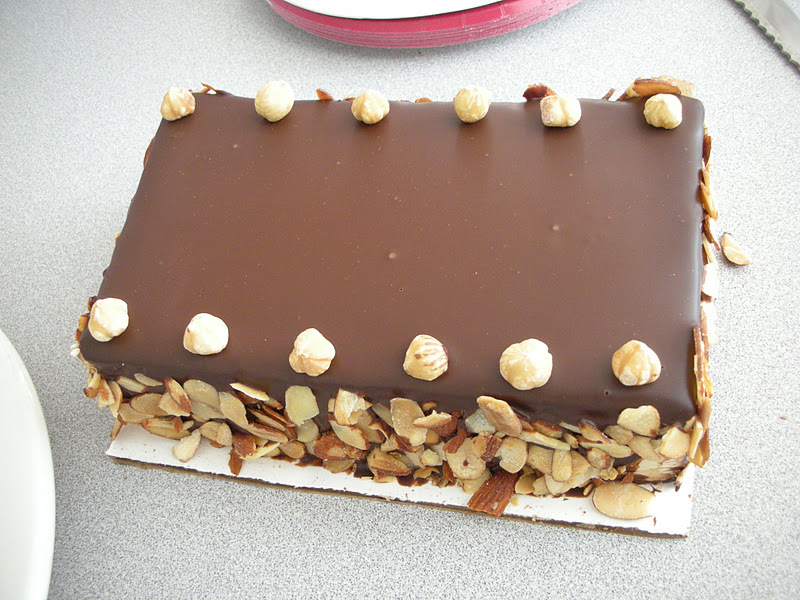 The classic cake is then decorated with a hard caramelized sugar in some random pattern on the top and sides. Some people make the caramel part a little more elaborate. 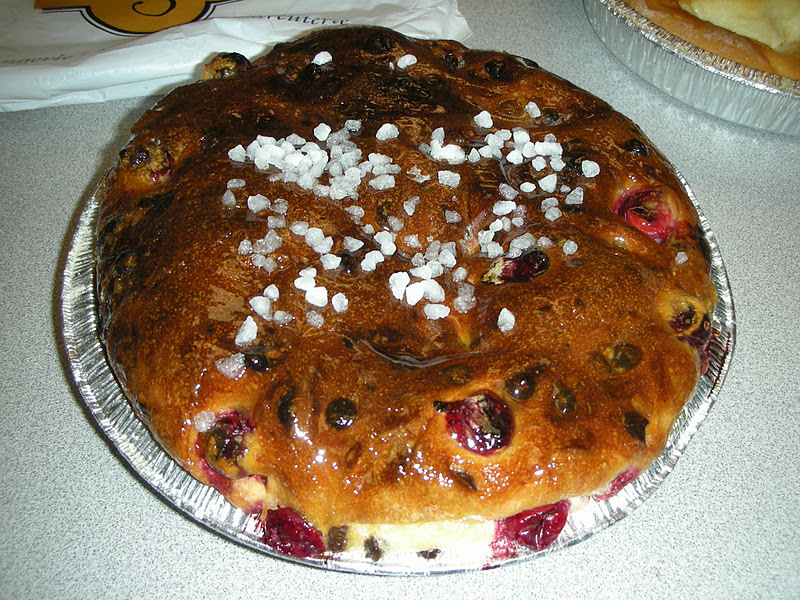 The one we were treated to was slightly different as the baker did not realize she was making anything classic. 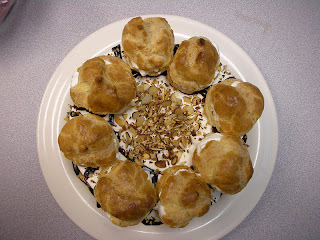 As was said she saw a cake with cream puffs on top so came up with one of her own. This one had the whipped cream base and the cream puffs on top. 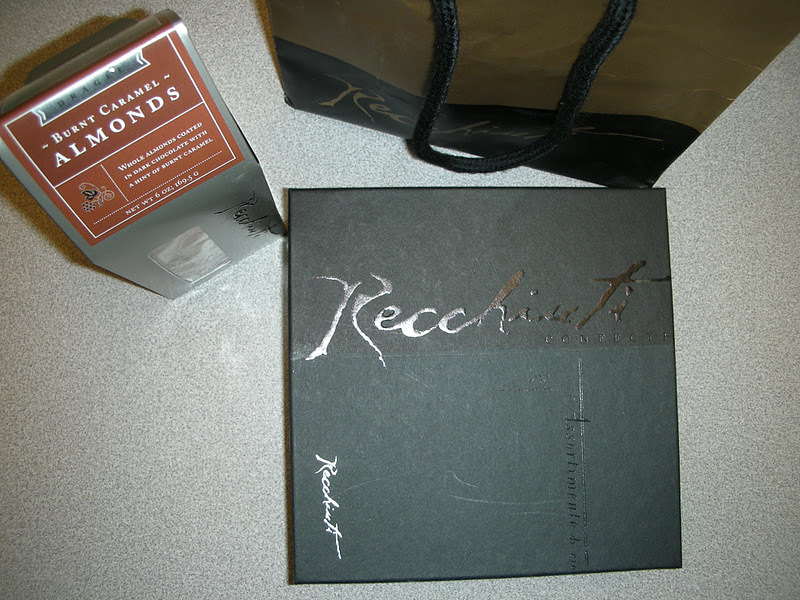 The cake itself was coffee flavored - nice touch. And the final decoration was with chocolate syrup instead of the caramelized sugar. 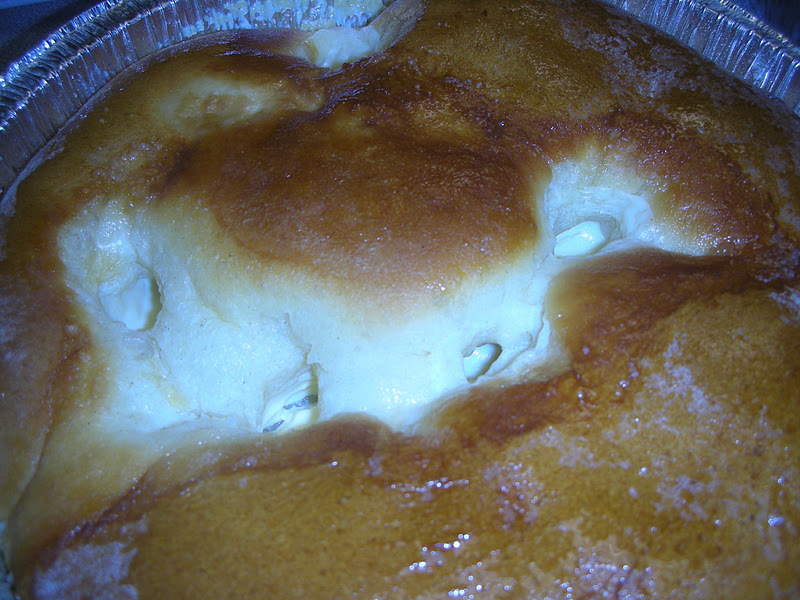 In the center on the to top she added sliced almonds. 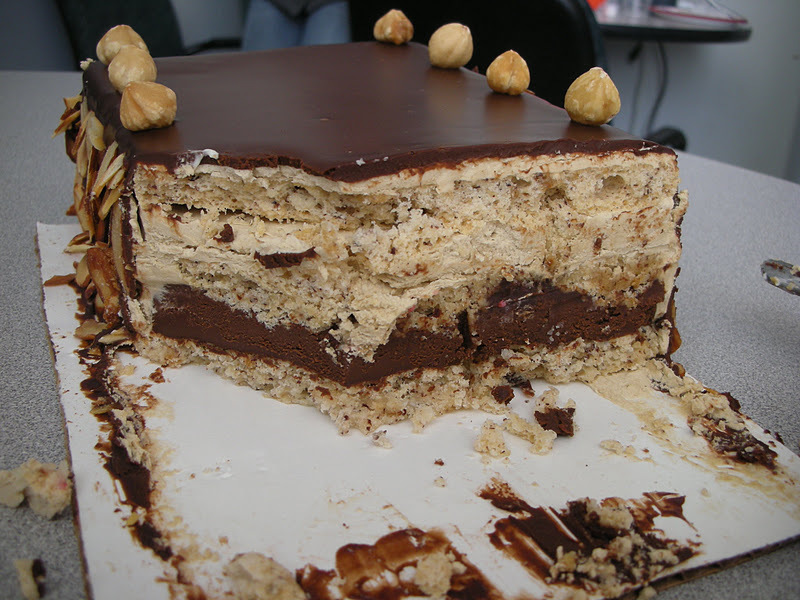 Moist, coffee flavored cake. An inspirational treat! 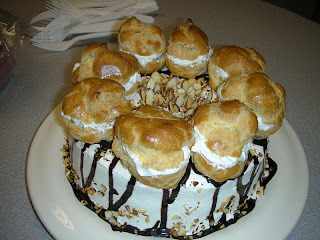 Now I know what a Gateau St. Honoré is. 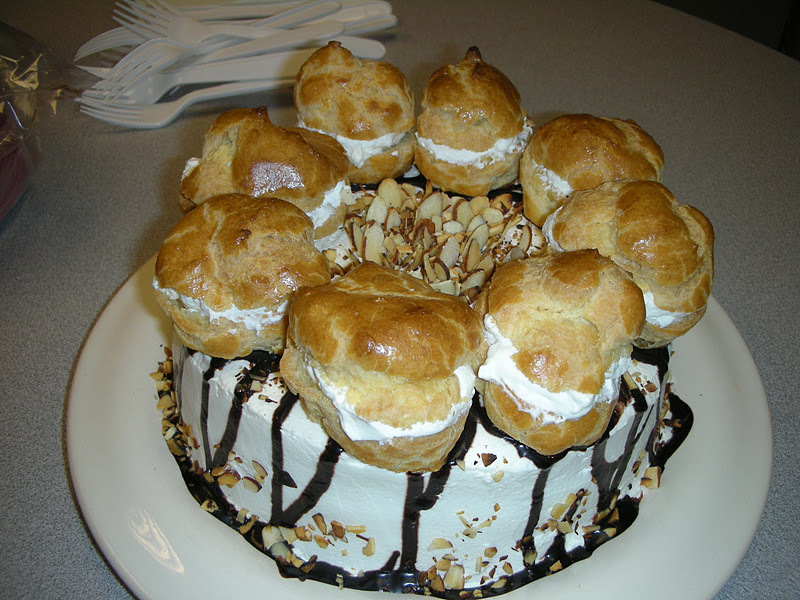 The cake was good and moist, the chocolate syrup was a nice touch and the cream puffs on top were the frosting on the cake as it were. So it may not have been the classic but great job coming up with the cake and reintroducing an old favorite. 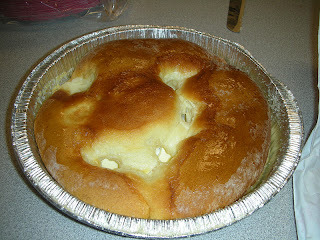 One of our colleagues was so inspired that she got the recipe and made one herself. Check it out. 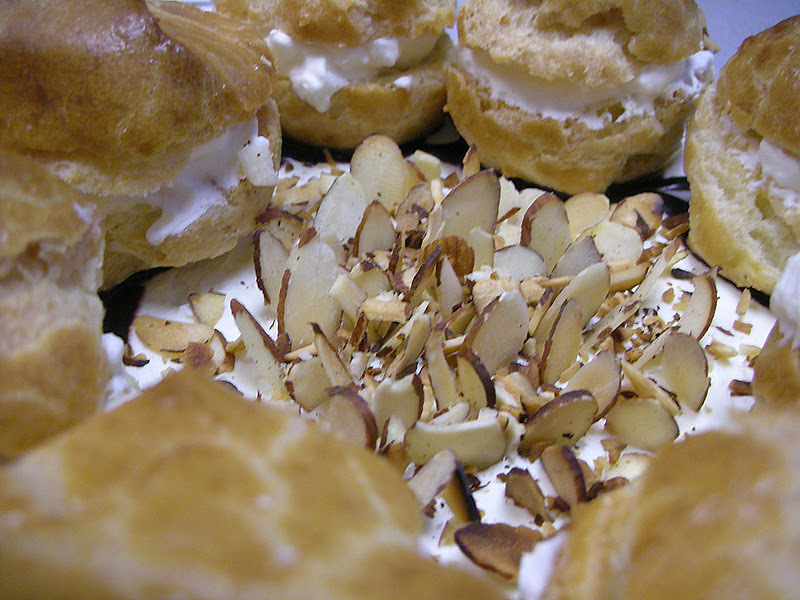 The Gateau St. Honoré rules! 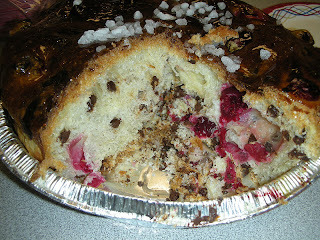 Inspired by cake hour - another Gateau success! So someone went on vacation. But where? It was assumed that the destination was probably New Jersey but no, that was not the case. Our intrepid vacationer in fact met up with a former colleague in his homeland - the somewhat exotic country of Turkey. I say somewhat because it is fairly developed which tends to make a place less exotic. But it is certainly an interesting place to say the least. Our tight lipped colleague did finally spill the beans. Of course, we knew something was up when we saw what she offered up at cake time! From Turkey with love, er, danger! Now we have had many treats brought to us from Turkey and we generally expect to find the typical Turkish delights. Look back and you will find some posts to that effect. 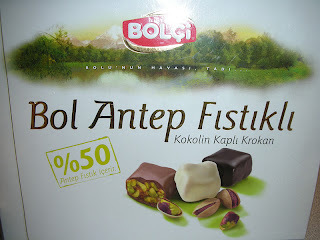 But these treats were a little different The translation of the name - Bol Antep Fistikli - is something like abundant pistachios and Kokolin Kapli Krokan is chocolate covered krokant. 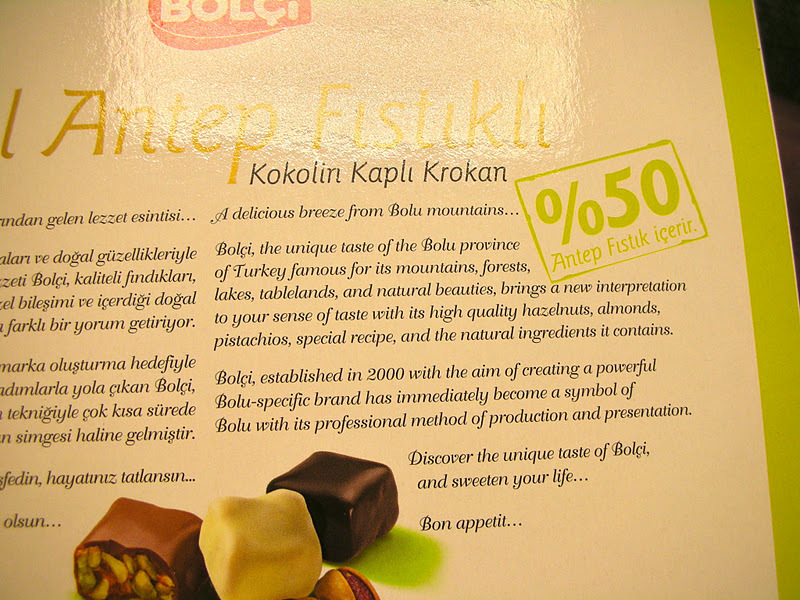 The brand Bolçi is supposed to be the unique taste of the Bolu province and the byline for the candy is, "A delicious breeze from Bolu mountains..." A delicious breeze? Apparently the brand was established to identify with the province. 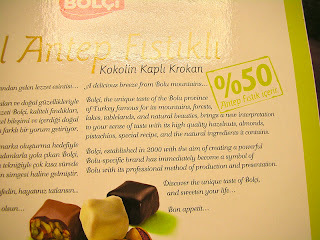 You can read the story and follow the advice, "Discover the unique taste of Bolçi and sweeten your life..." Nice sentiment. 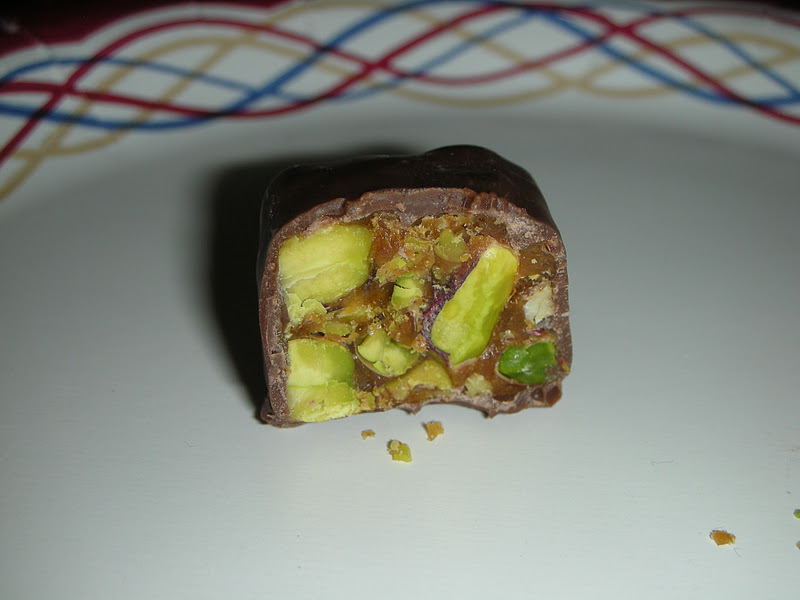 Plenty of pistachio in chocolate covered krokant. The strategy to brand the Bolu province. 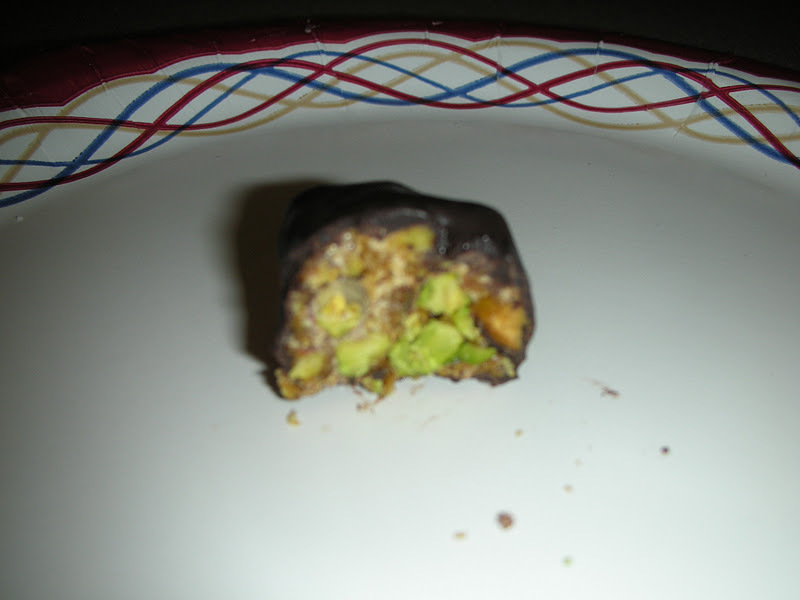 The 50% refers to the fact that over 50% is pistachios. That did seem to be the case! These were basically crunchy pistachio toffees coated with milk, white or dark chocolate. They were very good and nothing against the agar based Turkish delights but these were a different sort of treat and we were happy to try them. 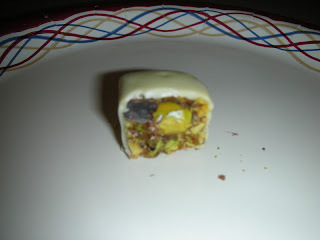 Milke chocolate covered with 50% pistachios! 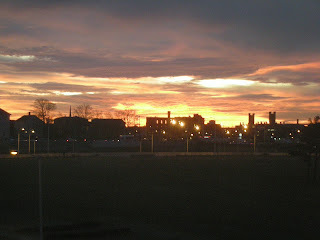 ...and dark! Is there 50% pistachios? You note that the title of this refers to a dangerous liaison. Although the the current and the ex-colleague were hooking up surreptitiously in a foreign country we were assured that everything was platonic. So it was not a liaison amoureuse which might have been a bit more interesting. There was some skepticism when the description "so cute" was expressed but we'll leave well enough alone. Traveling on your own to a foreign country to meet someone does have its dangers so we will settle for the title we chose. It's probably standard Turkish Delights! 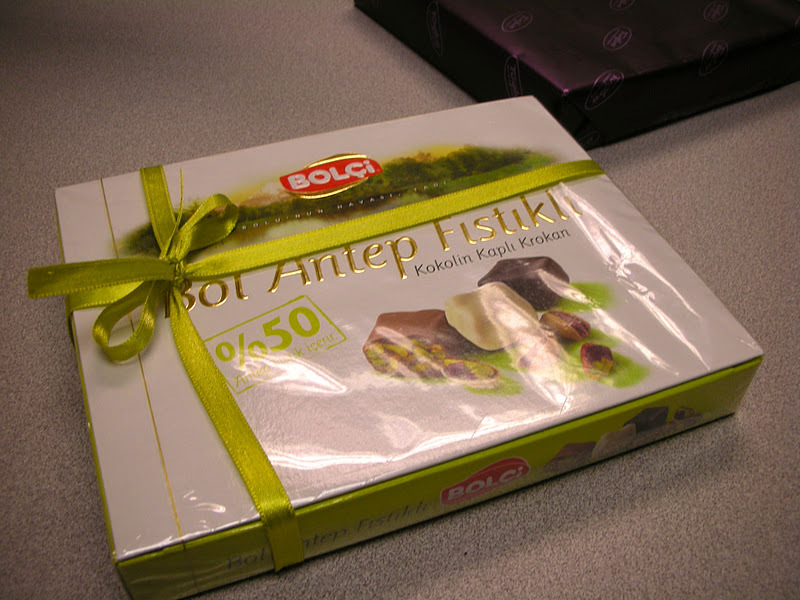 Our graduate colleague also sent us a little gift which we held off eating because the Bol Antep Fistikli was sufficient for the day. We suspect when we open the box from him it'll be back to Turkish Delights! Our colleagues from France paid a visit to Montréal over Thanksgiving. There they also speak French - sort of. Every Francophile on the planet knows that français québecois is different than what the Parisians speak. But what they speak in Lyon is probably different that how they speak in Paris. How they speak in Strasbourg is really different from all the rest because it is part German or Alsacienne...but that's another story altogether. I'm happy because it is in French. 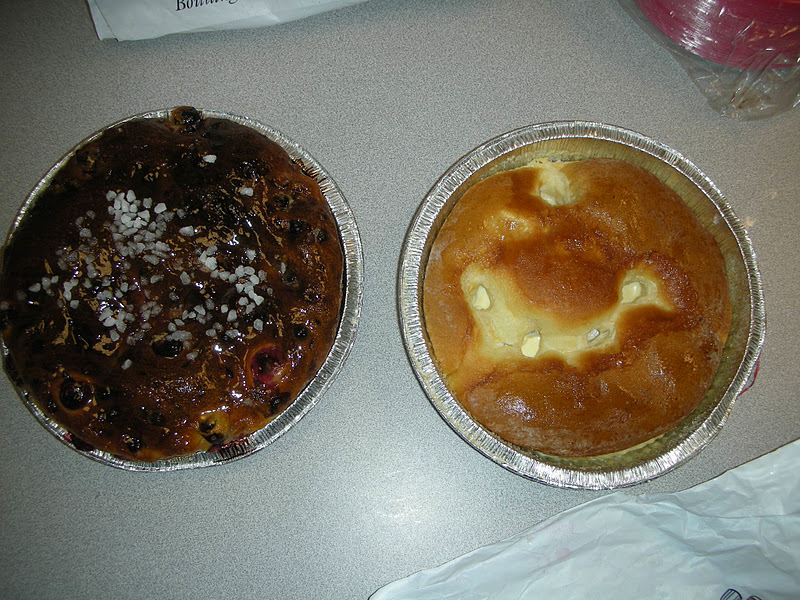 Anyway our visiting colleague was happy to come across a boulangerie and picked up a few items to bring back for cake hour. We don't know exactly what they are called, however. 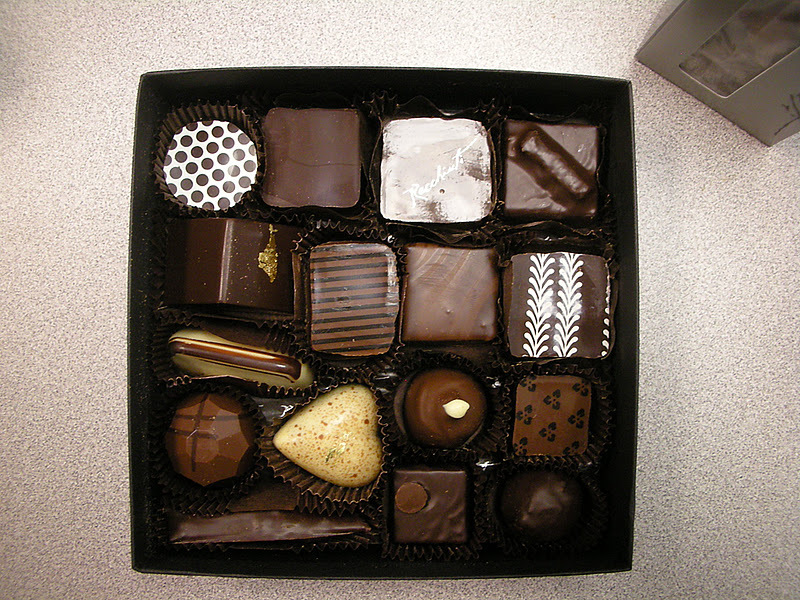 One of them is supposed to be a chocolate cranberry something. 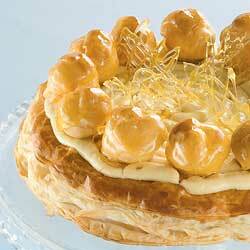 The other is like a cheese pastry something. Neither of them was a cake really. At least not as we understand a cake. They were more like breads. But the French refer to them as cakes and so we leave it at that. Are they cranberries...they seem a little big! The other cheese Danish-like bread had a few issues. For the first thing it also had the crystallized sugar pieces on the top when it was purchased. They apparently melted in transit. 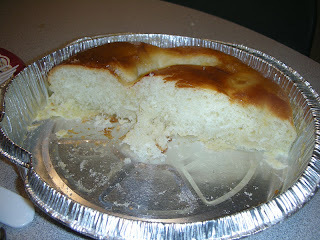 The sweetened cheese stuff also sank down and ended up being rather thinly distributed given the size of the bread, er, cake. Not that this made it bad. 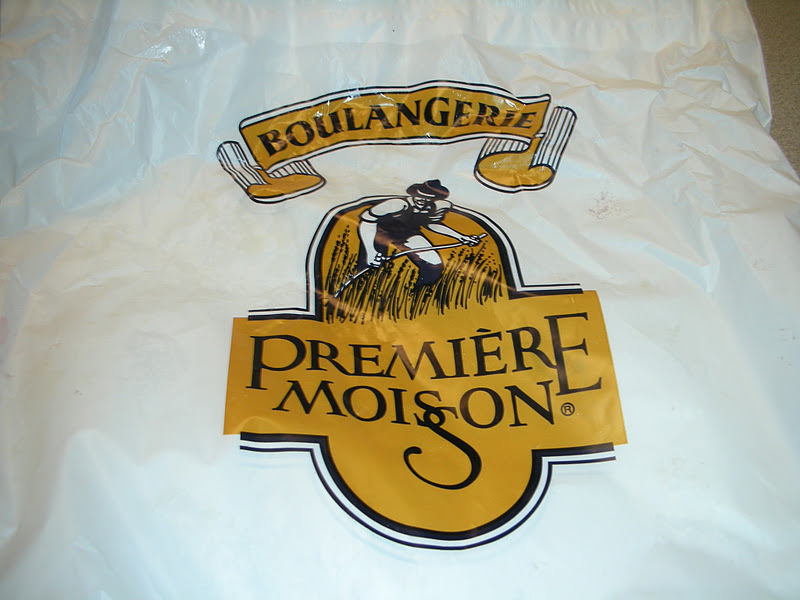 It's really something for quality control at the Boulangerie Première Moisson. That means the First Harvest Bakery, BTW. Where did the sugar go? The cheesy stuff kind of disappeared also! We did enjoy them. The only issue with the cranberry version was that it was a little difficult to cut hence the nom de cakehour gateau recalcitrant. You can translate that yourself. If you look at the picture of what was happening in the background you would think we were eating cake as Providence burns a la Marie Antoinette or Nero. 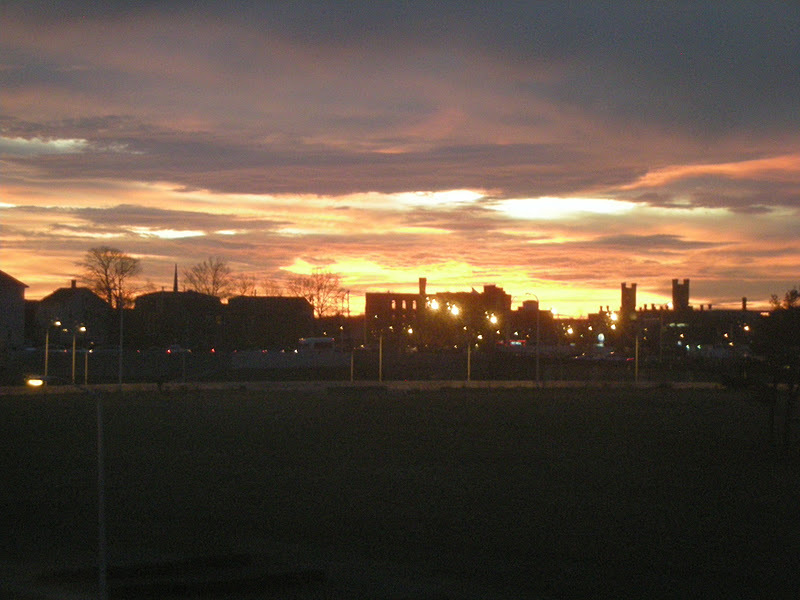 But it is merely and optical illusion of a great sunset shining through some distant buildings. This thing doesn't want to be cut!! Having just returned from the AASLD Meeting, aka the Liver Meeting, in San Francisco it was only appropriate that we feature some sort of San Fran specialty at cake time. During a stroll through the renovated Ferry Terminal on the Embarcadero we came across Rechutti chocolates. One of the strollers, who now hails from the Bay area spoke very highly of them and said they were very unique. So what the heck why not pick up a few to bring on back. From San Francisco with love! 16 pieces at about $2.75 each. I settled on their black box! Partly because of the description of the contents but also because of the price. These are not inexpensive shall we say. Indeed the 16 pieces for about $44.00 brings the price per chocolate tidbit to about $2.75 apiece. 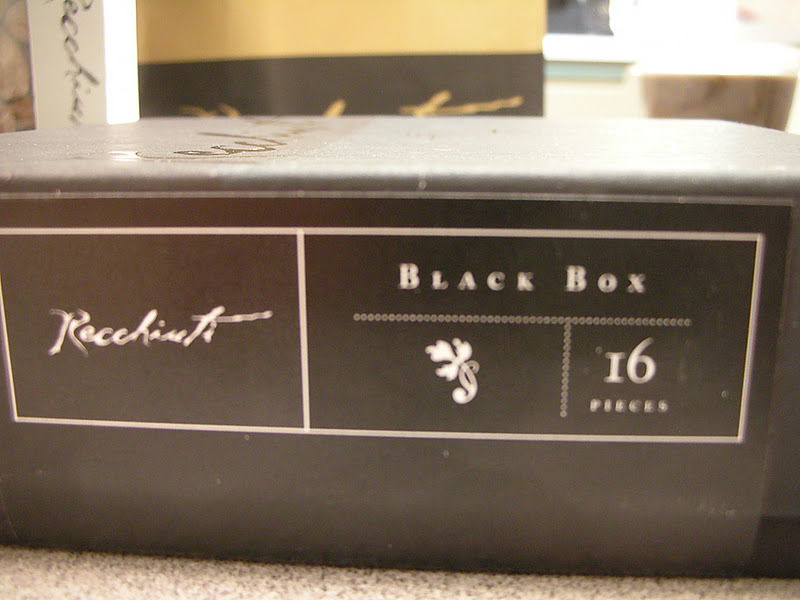 The black box included a menu with a description of what was to be found inside. 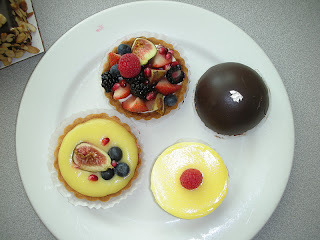 Several of them sounded very exotic...Star Anise and Pink Peppercorn, Tarragon Grapefruit, Lavender Vanilla, etc. The complete description with pictures can be found here: http://www.recchiuti.com/101.html?area=01;id=NszmuHPp. If you scroll over the picture on the website you get a description of the item. 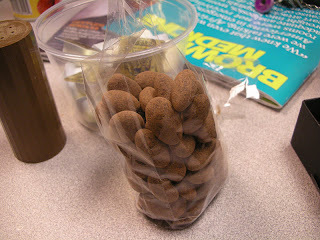 Ginger Hearts, Sur de Lago...interesting names! 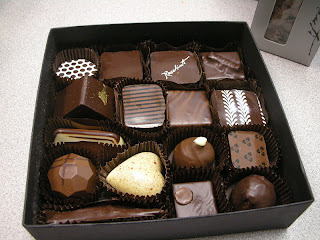 Going for the Kona Coffee Truffle! Gold leaf and all! Clearly with such delectable sounding items these chocolates were to be savored. 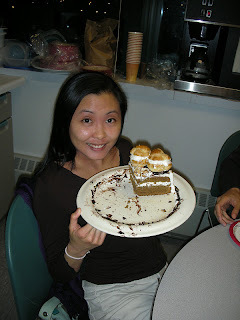 So despite the small size we opted to cut them up into smaller pieces so that the various flavors could be shared. There is no mistaking that these are very good. You could indeed taste the various items in the named of the various pieces and they made for some interesting combinations for sure. We were gradually getting through them all and were looking forward to each new one we could try. 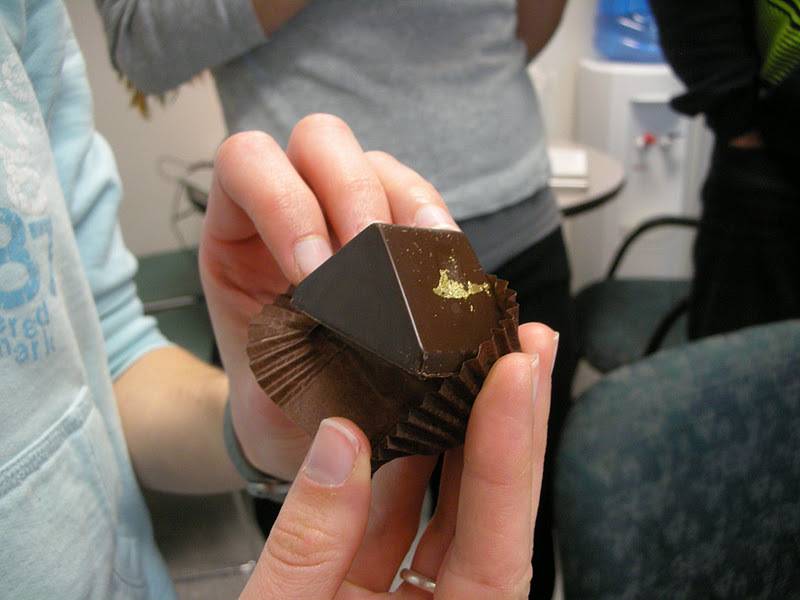 We did miss out on a few because a few colleagues, not realizing what these were all about, just walked up, grabbed a few and popped them in their mouths thinking they were Russell Stover or something similar. So we can't really say what the Piedmont Hazelnut tasted like because that one went down in one gulp. Pity, because it sounded good. The nut that started the whole Dragee craze - say what? ...with a hint of burnt caramel! 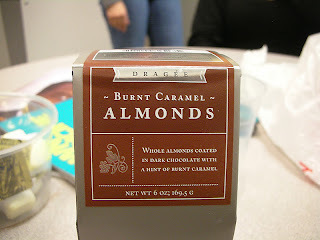 In addition to the Black Box we also got their signature burnt caramel almonds. From the website - Whole toasted almonds coated in dark chocolate with a hint of burnt caramel and finished with a light dusting of cocoa powder. 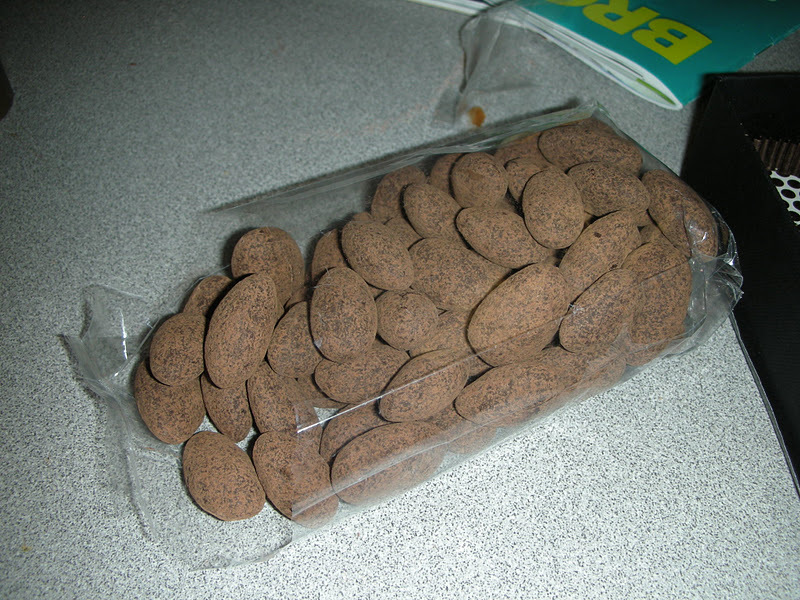 It's the nut that started the whole dragee craze." These were also very good. 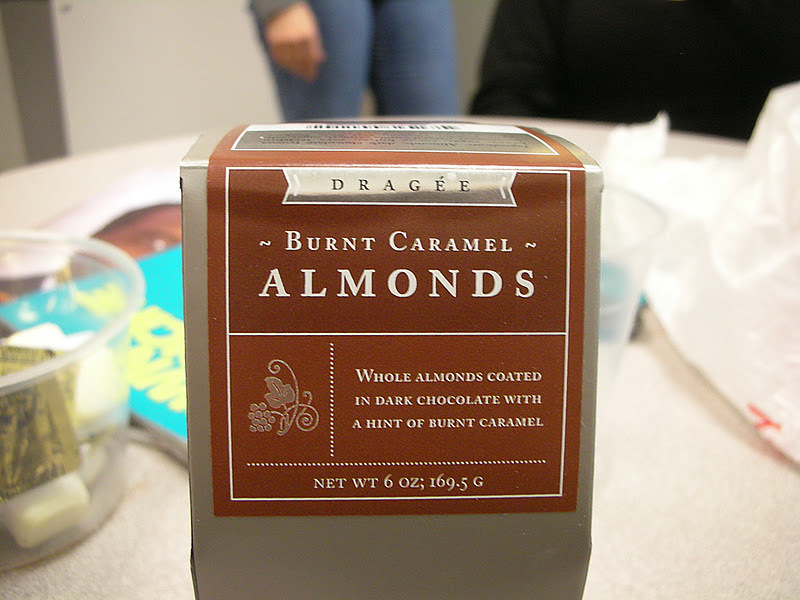 We have had this type of almond before minus the "hint of burnt caramel." It definitely added a little extra something and resulted in a more interesting flavor for the chocolate. We have no idea what the whole dragee craze might be but although we enjoyed them I'm not expecting any crazes to break out in Providence sparked by these particular nuts. All in all this was a good souvenir of San Francisco. 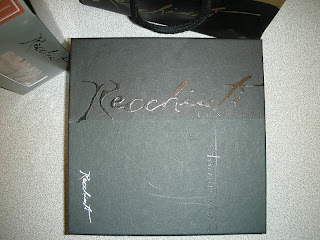 One of our attendees was so impressed she said that these would be her Christmas presents for friends and family. We'll let you know if she follows through. 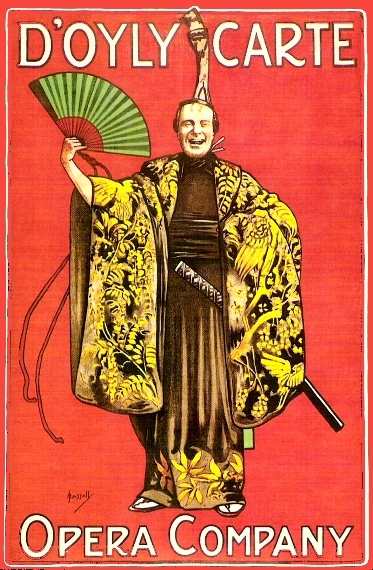 Tonight is opening night for the Braintree High Theatre Guild production of "The Mikado" which is directed, musically directed, choreographed and conducted by yours truly. 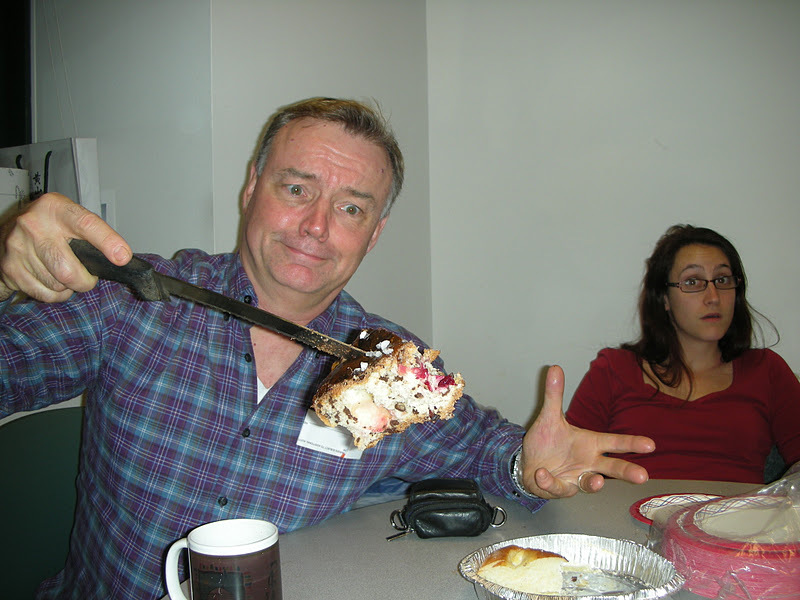 It is a tradition to have an opening night cake in celebration of the production but also as a way to thank those who supported it either through a donation or through purchasing tickets. 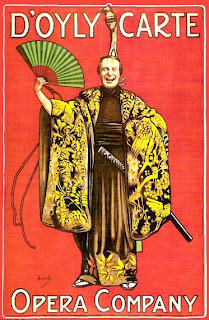 As mentioned this year we went with Gilbert and Sullivan. The students' response when first told about it was "the what?" Over the course of the rehearsals they came to really like and appreciate the work. It took some translating to get them to understand the things they were saying but that's part of the process. The surprise is that they usually had to be asked if they understood something. You might think the would preemptively ask but these are high school students. ...but it looked mighty tasty! 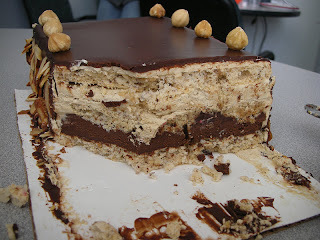 UPDATE it's called a hazelnut-almond dacquoise!! Good stuff on the inside especially the gooey kroquant layer! 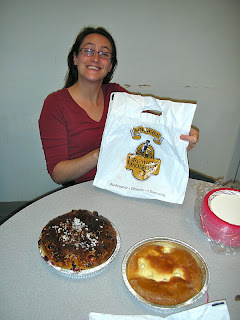 In addition to this being the night of the first performance it was also the first time that we had treats from the renowned Flour Bakery in Boston. 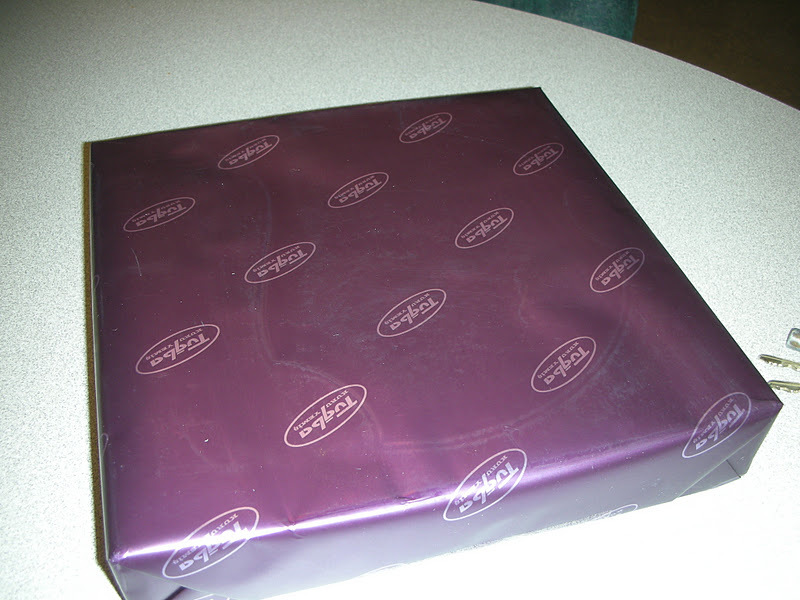 Since a car was on hand our provider was able to stop by on the way in and pick up the goodies. 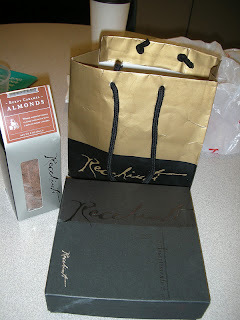 These included primarily the rectangular chocolate creation with the almonds. 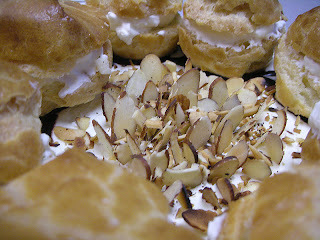 I forgot what it is called but it was a little like a big Napolean pastry. It was very, very good! It consisted of cake, filling and some kind of chewy crispy thing that was delicious. The quality of the chocolate and the other ingredients was obviously, according to taste, very high and altogether it was quite a tasty treat. Everyone was impressed and enjoyed trying it.